Energy extraction techniques such as directional drilling and “fracking” (short for hydraulic fracturing) have become a hot issue in both Amish and mass society. These techniques, some of which have been around for quite a while, have been hailed for their potential to transform the energy industry. Recent developments combining fracking with horizontal drilling have made the process much more viable, leading to the recent boom in states like Pennsylvania and Ohio. Supporters say these techniques make a lot of economic sense against the backdrop of rising fuel prices and energy market instability. Last summer, I spoke with an Ohio Amishman on this topic. Amish landowners in the region had been getting involved. One of the most respected business leaders in his community, he was deeply concerned over the issue, and the effects it might have on his people. Part of his concern was easy wealth. Energy companies pay for the right to drill on land. The price paid for a land lease can be substantial. Such a sudden influx of cash would not bode well for his people, he feared. He related stories of English who had experienced serious discord over the issue. Disputes over money and drilling rights had led to neighborly, and even family, disintegration. Another tangible concern the Amishman raised was the heavy traffic of transport vehicles disturbing peace and road travel. Others worry about the environmental impact of the process, with groundwater contamination and seismic activity among the concerns. Fracking for example relies on pumping fluid into the ground to fracture shale deposits and release natural gas and oil. The process produces salty wastewater which must then be disposed of. 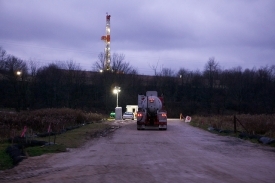 Recent earthquakes in northeast Ohio have been blamed on wastewater disposal wells. My girlfriend lives near Burton, Ohio with many Amish neighbors. Unfortunately, gas company landmen have taken advantage of the Amish folks’ trust and lied to them. The process is horizontal drilling with high-volume slickwater hydraulic fracturing, the same process that’s poisoning well water and causing earthquakes around the Northeast. A typical well pad will be five to ten acres, measure 70-90 decibels at 200-400 feet distance, and require thousands of truck trips. Because of low natural gas prices, companies are moving further into Ohio where more profitable liquids can be extracted. I am seeing Amish trust in gas companies decline – over broken promises of road repair, temporary disturbance, and wealth – but it may be too little, too late. All that said–and unscrupulous companies notwithstanding–rising fuel prices and question marks over traditional energy suppliers mean less-expensive domestic alternatives will become more attractive. Supporters argue that concerns over fracking are overblown and are being cynically exploited by an environmental lobby. They point to the economic boost energy extraction can bring to depressed communities. Others note that developing domestic resources will enhance national security by reducing foreign energy dependence. The topic is pretty heated. This recent article from Popular Mechanics addresses controversial claims over fracking and natural gas drilling. Here’s a pro-fracking view. And an anti-fracking one. What do you know about alternative energy extraction techniques? Have you seen them in your community? Are they a threat or a boon? Fracking for oil and gas is hardly “alternative” energy. It’s merely conventional fossil energy harvested via a new twist. I don’t have an opinion as to whether fracking for oil and gas is really bad environmentally or not, but I do know that the US enjoyed its peak in oil production 41 years ago, back in 1971 and even though fracking for oil (mainly in North Dakota), has caused a small bump up in domestic oil production, it’s just that – a bump. Oil production still stands at only about 60 percent of its oil peak, in terms of daily oil production. Meanwhile, worldwide, oil production has also seemed to have peaked, somewhere in the 2005 to 2008 time frame – all while countries such as India and China are adding millions of new cars and drivers to their roads every year. Oil prices have nowhere to go but up, given all this. Fracking may buy us some time, especially on natural gas, but longer term, the cheap, easy, oil and natural gas supplies are gone and given such, it would be sad that, after we have to move off of oil and natural gas anyway, we’re left with thousands upon thousands of polluted drinking wells, ponds, and whatnot, due to a last frantic push, searching for oil and natural gas. Stephen, if you read the entire phrase, “alternative” is referring to “techniques”. Which is basically what you’ve stated here with your description “conventional fossil energy harvested via a new twist.” Sorry if that wasn’t clear. I don’t use “alternative energy” anywhere here–I’m not even sure what “alternative energy” would refer to anymore. I really do not know enough about this subject to make much of a comment but I do have a question, why are we not tapping into one of the largest oil reserves in the world up in the Dakotas and Montana? Is it a similar type problem? Truthfully, if I had land I do not think I would sell out for easy money. That never winds up being a good deal in the long run. And I guess I would be suspicious of “corporate America” right from the get go and assume the promises to be false. I feel for the Amish in this situation as they want and need to be trusting and I am sure many will be taken advantage because of it. This is a HUGE hot issue here in the Finger Lakes of Upstate New York. The gas industry has been held at bay with lots of moratoriums here in New York, but just over the line in Pennsylvania they are fracking like crazy. I know a lot about the divisiveness of this issue–it is very similar to the divisiveness when wind turbines came into the area. I never realized how nasty people could get and how underhanded (“ends justifies the means”) they could become when their “viewshed” was threatened. This issue has possible serious consequences to our watershed, however, and the unending heavy truck traffic would not have a final date (such as when the wind turbines were built and the roads restored). Also there is the whole issue of a poor area needing the income…many, many factors which make for a “perfect storm” of controversy. As a result, I have opted out of many town board meetings I used to attend—just too many people at each other’s throats, unfortunately. When we lived in Noble County, Ohio (we had Amish neighbors there), we had a gas well drilled and fracked on the property we were living on. So they drill down to 3000′ (took a week or so). Dump 50 or so tanker trucks of water in the hole and then fracked. Then they opened the valve on top to take off the gas and turned the donkey head pump on for the oil. For a couple of weeks they had to take a tanker full of salty water out of the oil tanks every day or two. After that it was only occasionally. The well pad was maybe 1/4 an acre. We lived within a couple hundred yards of the whole process. We could hear the drilling at night, but it didnt really bother us from sleeping. It was not a big environmental disaster, other than the company didn’t take care of the road they had made on the property like I would have preferred. But when I called them, they seemed to make an effort to please me. It was a very steep road and they were trying to get it sowed down so it wouldnt wash, but the soil was poor to start with, so they were having a tough time. Fracking causing earthquakes??? We lived, as I said, within a few hundred yards of the process. They dumped maybe 25 tanker truck loads of water in the well, and basically dropped a drilling rod on the top, which was the equivalent of hitting the water with a huge sledge hammer. That wham from the dropping rod would build up momentary pressure on all the water they had pumped in. The water had seeped into the cracks of the surrounding rock at the bottom of the 3000 foot deep well. The result? You had an area equivalent to where 25 tanker trucks of water would extend (line up 25 tanker trucks side by side, and you get an idea of just how small an area that really is–maybe an acre wide a few feet deep???) that would get up to 15,000 thousand pounds of momentary pressure. Yeah, I think the environmental concern is overblown a bit. But I am not saying that there isnt or couldnt be negative effects of the process in some cases. Mike, thanks for this firsthand description, this is really interesting. Sounds like your experience was relatively benign. I am too light a sleeper and would probably not do as well with round the clock drilling, at least not without a good pair of ear plugs. Myth No. 4: Earthquakes are a constant danger from fracking. Fracking itself – as distinct from wastewater disposal – is in no way responsible for the tremors. Federal officials have confirmed that fracking is not the source of tremors in Ohio and several other states where gas drilling is done. William Leith, senior science adviser for earthquake and geologic hazards at the U.S. Geological Survey, told National Public Radio recently: “The fracking itself probably does not put enough energy into the ground to trigger an earthquake. … That’s really not something that we should be concerned about.” Oil and gas waste water disposal wells, on the other hand, have some history of causing tremors, most recently in Youngstown. By reducing the volume of water injected and the depth of waste water injection wells, and avoiding earthquake-prone areas, the risk of inducing tremors, however small, can be reduced even more. I will not say whether I agree or disagree with what Stephen B is saying, but as to the KNOWN FACTS (in terms of oil production) that he presented … they are fairly accurate to the best of my knowledge & I have 30 plus years experience in this particular industry. Since I work for a company that just yesterday announced that they are paying 2.5 billion dollars for 100% interest in a company that operates in the Marcellus Shale I cannot be too specific in my comments. In general what Erik has said as to the process of drilling and fracturing the gas rich shale formations is accurate. Like he said neither drilling, nor fracturing is new. Both have been around for well over 100 years. Since the shale formations are relatively shallow and lay in fairly narrow bands (thickness of the formation) the traditional type of drilling could not be used. However once the process of directional, particularly horizontal drilling was perfected the pursuit of gas trapped in shale deposits became feasible. They can now literally drill down the length of a shale deposit in a relatively straight line; then fracture that formation and extract natural gas that was previously inaccessible. The impact that this has had on the industry is unbelievable; patterns of operation of the major pipelines that deliver gas to city utilities, commercial electric generators and to industry & other commercial users of gas that have been in place for decades are now out the window. Whole new methods of operating these systems have had to be devised to manage the massive inflow of gas into the market place. I know that this is going to disappoint those that believe all energy supplies are manipulated to maximize price, but the surge in shale gas production has shot your beliefs all to hell. Example: for much of my career natural gas had sold for approximately $1.20 to $2.50 per dekatherm, mostly toward the lower end of that range or even lower. Due to massive increases in demand for electric generation across the nation over the past 15 to 20 years or so that price had steadily risen to well in excess of $5.0 in most areas, with certain supply deficit areas consistently seeing prices more in the $7.0 to $8.0 range, with spikes during peak demand to $13.0, $14.0 or more. These are wholesale prices at specific marketing hubs, not what you pay your utility company. The spot price yesterday at a major hub near where I live was $2.35 per dekatherm. In real, constant dollars natural gas is cheaper now than it was in 1990. I am not saying whether the issues being raised by detractors are valid or if they are invalid. I am also not saying whether the cheaper price of gas is “worth” the trade offs; IF their concerns are proven to be valid. Nor am I saying if this is a phenomenon that can or can not be sustained over a relatively long period of time. There are too many unknowns. I am simply saying that this is the impact that shale gas has had on domestic energy prices. If you live east of the Mississippi, especially east of the Appalachians and north of the Carolina’s & if you have electricity much, maybe most, of the fuel being burned right this minute to generate your electricity is probably shale gas. The fact that the fuel cost multiplier on your electric bill (and therefore your electric bill itself) has not gone through the roof in the past two to three years is attributable to the increase in the supply of natural gas, almost all of it shale gas. Whether you deem that valuable or not is a whole other subject. I can see the concerns of the Amish. I can also see the concerns that other people have raised as well. I guess your perspective l depends on how it impacts you personally. The Amish and others can refuse to sign lease agreements, there is no eminent domain for drilling / production pad sites. As far as impact goes, my neighbor’s son purchased 700 acres of property in South Texas for $1,000 per acre about 4 years ago. Amazingly he also got the mineral rights to the property. Less than a year later he leased it out for shale gas exploration and production. His lease payment was $700,000. He paid his note off less than a year after he purchased the property. I’d bet his perspective is pretty favorable toward the industry. Not everyone has been or will be that fortunate. Thanks for the clarification Erik. After I posted I was looking again at today’s post and saw that you were referring to the methodology of drilling rather than the fuel itself, but this blogging software doesn’t allow for edits or comment removal. To me, “alternative” energy has usually meant renewable ones, such as wind, solar, and small-scale hydro power, though clearly, in the most literal sense, alternative simply means different from the mainstream sources currently in widespread use I suppose. I read an article recently that argued that the boom in natural gas production and its current low price has more to do with speculation on the land that is being obtained by the oil and gas companies, than on the actual profit made from selling the gas. Fracking requires a lot of energy, so it stands to reason that the net returns on the sale of shale gas would be fairly low. If this is true, then fracking is yet another bubble getting ready to burst. Would you happen to know where I could find that article Naomi? I obviously haven’t read it, but based on what the premise alone I would be skeptical. About 20 years ago I worked on the trading floor of what was at that time the largest natural gas producer and shipper in the US. My job involved managing a portfolio of production that originated in a specific region of the country (Gulf of Mexico onshore and offshore) and was delivered to markets in a specific region of the country (upper mid-west). I became really curious whenever there was a major run up or drop off in prices as to what the driver behind these price movements was. When one of us coordinators was ever supply deficit or had surplus supply in our portfolio we would look to move it to other coordinators within the company. Invariably whenever I was supply deficit, the other coordinators would be too. If I was swimming in surplus gas, they would be likewise. We would then go outside the company looking to pick up incremental supply or dump off any excess supply on the spot market. Sometimes that would work, but often within a matter of days we would see the spot market begin to run up or down. When that would happen I would start snooping around the industry calling directly to contacts that I had within the industry attempting to locate or place supply. Sometimes that strategy would work other times, most of the time, it was a no go. The times that supply was flat not available or there was virtually no market for it I would start asking my counterparts both within and outside the company one question: “Percentage wise how long (or short) are you on supply for your piece of the puzzle”. In other words how much extra gas do you have or how much deficit of gas are you (or your company) in terms of percentage of the total that you produce? Turns out that question actually may have been illegal to ask, and today virtually no one at any company would dare ask or answer that question. However, at that time I could probably make 10 calls like that and account for 40 percent or more of all gas being produced in the US. That would be more than enough of a representative sample to get a good feel where the industry actually stood +on this issue. Care to guess how much of a shortfall or over supply of gas in the “on hand” inventory would cause a huge run up in price or a sudden collapse? 10%, 15% maybe 20% or more? That is what I would have thought. Turns out that the number was more like 2, 3 or 4 percent. I have since shared this number with people that have managed or traded other commodities; grain, cotton, base metals etc. They tell me that a similar number will drive prices up or down in their industry as well. There is really that thin of a margin for the balance between supply and demand. BTW: Part of the most recent spike in crude prices is attributed to the fact that the EU, Greta Britain especially, will cease purchases of crude from Iran over their potential enrichment of uranium to weapons grade. As such Iran has either threatened to curtail their production or already has begun to do so. Iran produces about 2.5% of the world’s supply of crude. Interesting to say the least. In regards to your last paragraph, here are some other links related to the situation in Iran. As global energy costs rise and demand threatens to catch up with supply, the risk of price spikes and supply disruption becomes great enough that it makes good sense to be prepared just as for a natural disaster. The resilience and self sufficiency of the Amish is a helpful inspiration. I taxi for Carroll Co Ohio Amish and this whole topic is VERY big here. The well pads are huge(fenced retention ponds, a couple acres of truck parking, guard houses, high voltage lights..it’s amazing) while the drilling is going on and I don’t know how large they will be when the well is finally in production, the truck traffic is terrific and our township roads are getting beaten to pieces. During drilling, which is round the clock, the noise and light pollution is significant. The per acre lease payment is substantial and has risen dramatically since this whole process started. A couple years ago it was $50 to $250 an acre depending on the particular company one was dealling with. The last I heard (reliable info) was $5800 an acre for a 5 year(5 year renewable)lease. Yes the money is a problem. People who got less have strong feelings about the current prices. Comments are made is rather snide ways about “Joe’s new lease money driveway” and the new farm equiupment that is showing up. This is among the English and the Amish. Many of my Amish customers some who have leases and some don’t are worried about the fracking and it’s effect on the water supply. The oil company says it will supply water if you can prove that fracking ruined your well but people with dairy herds and wateer dependent grower operations are concerned. We have several organic dairy farms owned by Amish and they are concerned. I will say that the oil companies have worked with the county and townships and are repairing or rebuilding the roads that their trucks use and there are sign on many roads “No Oilfield Traffic”which does keep the damage to specified roads. Ann this is really interesting. As a general rule I am pro-growth and for using innovation to solve problems, but the social effects of the fast easy money is the ugliest aspect and needs to be considered–I can bet it breeds some envy and creates community issues (and I think the threat of that is blind to one’s religion or lifestyle). $5800/acre can be like winning the lottery depending how much land you have. And lottery winners often don’t turn out well. The Amishman I mentioned in the post talked about disputes in which one landowner did not want to join the other three, as apparently–and I might be mis-describing this somewhat–there is an acreage minimum on the lease, necessitating banding together with neighbors in some cases. Watch Gasland -- I second that! Fracking is a desperate move. It is destroying our water supply, our land, and health. We need to reduce energy use, not scramble desperately to look for more fossil fuel. This is all very interesting to me. I also live in the area of Ohio where this is huge. At this very moment, a new well is beaming it’s lights at me outside my kitchen window. It suddenly appeared this week in the cornfield right next to our home. We had no idea it was going up. They aren’t drilling yet, but I wonder what will happen when they do. Although I still haven’t formed an opinion about fracking, it has ruined the pastoral view to the east and we now will have at least some vague concern about our water. And will this do anything to our property value? No one ever talks about that aspect. There are some Amish around here who have gone with the wells but I haven’t yet seen a lot on their property. I can completely understand the concerns as related to their beliefs and philosophy. Without going into details, I’ve found out that the new well next door is already causing terrible dissension within the family trust that owns it, due to one person who controls it. Greed is a terrible thing. I guess like anything we’ll know over time, but right now, I’m not so sure this “boom” here is going to end up to be quite so great as people think.